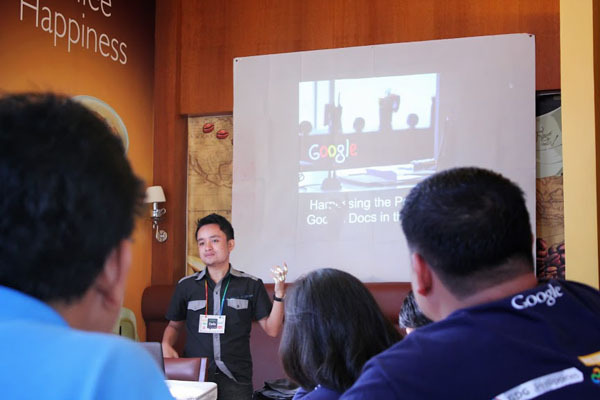 Last week, Google Business Group - Cagayan de Oro was formally launched. It was attended by a number of business minded individuals who were interested by the power of Google Apps and I am glad to be the co-manager of the said community. As part of the group's vision to spread awareness of the usefulness of Google Apps in Business, I was assigned to do a talk on how Google Drive could be a powerful tool in the office. I use Google Drive every single day in my line of work. So, I was really excited to share my thoughts to everyone. I presented three main issues with using Microsoft Office before. This was followed by how Google Drive was able to solve all of these issues that is why I decided to stick with it. How many times have you found yourself not being able to work because you left your files at your home computer? Have you been using thumb drives to store your files so you could bring it anywhere? This is the common scenario for people who rely on Microsoft Office for all their documents and spreadsheets. Access to their files is limited to where their documents are. These files are usually just available on a specific computer. This kind of setup has probably grown on you. But, I think you would agree with me that this is such a hassle. With Documents and Spreadsheets in Google Drive, you experience the versatility of having your documents, spreadsheets and even presentations in the cloud. There is no need for data storage or backup since everything is handled by Google. If you have a smart phone, a tablet or a desktop computer, you just open your browser or the Google Drive app and then you can start creating and editing your documents on-the-go! The blue screen of death, computer viruses, reformatting your computer, failing to backup, forgot to save. Are those situations familiar to you? I've experienced all of them too. They could make you lose hours, days or even years of hard work in just a single snap. With Google Drive, you are guaranteed not to lose your data. It is completely powered by the Web. It even has an offline mode so you won't worry if your internet connection is acting up. For instance, I lost my computer when typhoon Sendong totally washed out our area. Though I had to buy a new computer, I did not worry about my files. Everything was there in my Google account. I was able to access them immediately after logging in Google Drive on my new computer. Pretty awesome. In an office setting, collaboration is very important. If you can make collaboration more efficient in business, the more productive people become. Back when I was using Microsoft Office for my files, I had to make hard copies if I decide to have them reviewed by other people. Another alternative was to email copies to those people and have them send those back to me so I could finalize everything. It was a time consuming process and is definitely not efficient. Documents and Spreadsheets on Google Drive were built for collaboration. This is where these apps stand out. They make collaboration easy and very efficient. Multiple users on different locations can edit sheets and documents in real time. Sharing is as easy as adding user accounts. Discussions on revisions are very efficient as you can easily put in notes and comments that notify the necessary people immediately. Revision history can also be seen so you will know who edited which and on what time. Those and a lot more. Collaboration becomes twice or thrice as fast. This equates to a boost in productivity! It's a win for businesses. Those three issues were from my own personal experiences. I've found that Google Drive has solved all of them. It has made me and my team of remote workers more productive than ever. In fact, we've already streamlined a lot of our processes (schedules, to-do lists, plans, etc) on Google Documents and Spreadsheets. It definitely made everything easier especially that I work in a virtual setting. This is also an exciting time in technology. We are witnessing the transition from a desktop installed software to software hosted in the cloud. A lot of the programs we are now using are powered by the web. We may not notice it but we are already using a number of them (Facebook games, email). It just so happened that Google is one of those that provided such powerful tools that greatly help people in business. Google Drive contains a fully functional word processor, spreadsheet and presentation application. With the added benefit of accessibility, stability and collaboration that gives a productivity boost, it is definitely worth trying. Let me know if you have your experiences with using Google Drive! I would love to hear those.